Built in Spain by Airtificial, HTT showcased their full-scale Hyperloop passenger capsule for the first time. 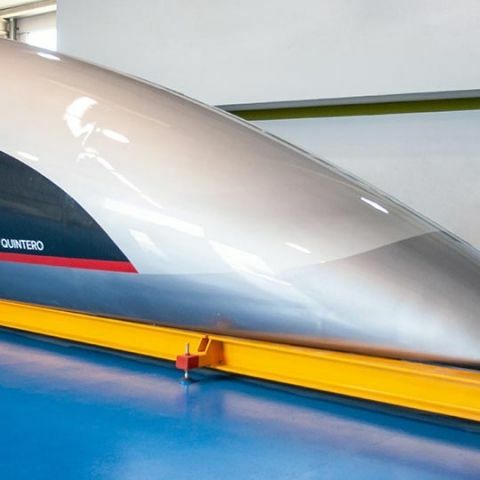 At an unveiling ceremony in Puerto de Santa Maria, Spain, Hyperloop Transportation Technologies (HyperloopTT/HTT) revealed their full-scale Hyperloop passenger capsule. The ceremony was primarily organised to celebrate the five-year founding anniversary of HTT where everyone got a first look at the capsule. It will now be sent over to HTT’s research and development center in Toulouse, France to be tested on its commercial tracks. Called the “Quintero One”, it’s constructed mainly with HTT’s Vibranium which is a special dual-layer composite material, not to be confused with the fictional metal from Marvel comics. The capsule was built in partnership with Airtificial in their aerospace facilities in Southern Spain. Airtificial came into existence after a merger between composite expert Carbures and engineering company Inypsa, a manufacturing company for Airbus, Boeing and others. Speaking of the design, it was created in collaboration with PriestmanGoode that went on to win a Gold Award at the London Design Awards in 2017. How feasible is Virgin's Hyperloop plan for India? “In just five years we have solved and improved upon all of the technology needed for Hyperloop with our new levitation system, vacuum pumps, batteries, and smart composites. This capsule will be a part of one of the most efficient transportation systems ever made”, said Dirk Ahlborn, CEO and co-founder of HTT.